The events at UC Santa Cruz and in the Santa Cruz community are part of a nationwide effort to build awareness of sexual assault, dating violence and gender-based violence. 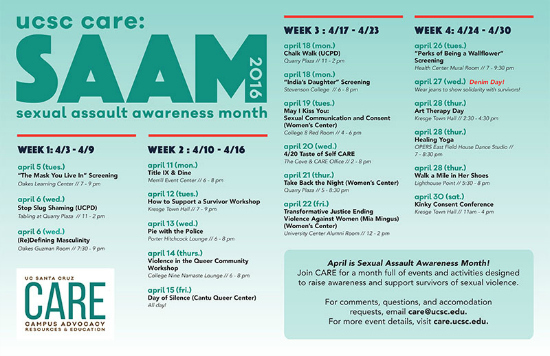 CARE (Campus Advocacy, Resources & Education) is the primary point of contact for survivors who experience any form of sexual violence in the UC Santa Cruz community. CARE director Emily Crutcher and her colleagues provide confidential advocacy and resources. She emphasized that SAAM is a student-led effort. Taylor said students got together and “decided all of the different objectives of what we want people to know about.” Student volunteers in the CARE office’s growing volunteer program then put the program together. Planning began with general themes for each week, and organizers collaborated with other groups across campus. Themes include gender and masculinity, resources on campus, and healing and alternative therapies. Among the events is a workshop on “Violence in Queer Communities” in collaboration with the Cantu Queer Center, Thursday, April 14, from 6-8 p.m. in Namaste Lounge. Take Back the Night is planned for Thursday, April 21, at 5:30 p.m. in partnership with the Women's Center with a rally at Quarry Plaza, march, and speak-out. The Women's Center describes the event as a time for survivors and allies to speak out on ending sexual violence in a rally and march through campus, culminating in an opportunity for survivors and allies to have their voices heard in a safe space. Keynote speaker will be Mia Mingus, a writer, public speaker, community educator and organizer. Wrapping up the month, is a variety of alternative healing and self-care workshops including Healing Yoga, Wednesday, April 27, 7:00-8:30 p.m. at the East Field House. It will be a free trauma-informed yoga class open to all UCSC students, staff, and faculty. Modifications and alternative postures will be offered.